Mini Vinnies is part of the Society of St Vincent de Paul. The St Vincent de Paul Society (SVP) is an international Christian voluntary organisation dedicated to tackling poverty and disadvantage by providing practical assistance to those in need. ‘Mini Vinnies’ are children aged between 7 to 11 who are encouraged to embark on their first steps as possible ‘Vincentians for life’. 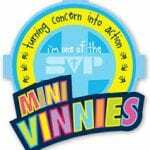 As Mini Vinnies, the youngsters have their own ‘treasured’ Prayer, Pledge and Badge, a dedicated website (www.minivinnies.org.uk/) and a range of bright and colourful documents which guide them in their formative steps – helping and enabling them to become in every sense, young Vincentians – or ‘Mini Vinnies’. 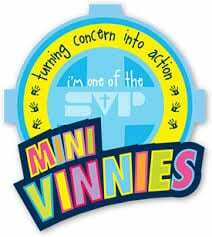 At St Bernadette's, pupils apply for positions on the Mini Vinnies team - we have so many wonderful children who want to make a positive difference in our community that we have developed three branches to our team - Prayer Leaders, Community Leaders and Eco Leaders. Needs met by our actions. I promise to make a difference. Vulnerable people are our concern. I ask you Lord, to help me in my mission. Now is the time for caring. Never giving up on the lonely. It is a privilege to serve my school. Everyone matters to a Mini Vinnie.